Join the discussion on our forums! Come discuss Cursed Castaway over in our dedicated Cursed Castaway discussion topic. This is a fairly balanced card; which means it doesn't hold up against the very powerful options of the current standard set. Best case scenario: Drop it on the board; destroy (or at least damage) and enemy minion and retain a 5-Attack minion. That way, it would be like a cheaper Firelands Portal that summons a Magma Rager sized Loot Hoarder. Usual case: Using it as removal + draw a specific card - it becomes like a Rogue's Starfire with immediate combo synergy. At worst: You could also just drop this on the board as 5/3 with DR: Draw a card; like a slightly bigger but even worse Polluted Hoarder if you need tempo. Currently it's outclassed by all the very powerful cards from Journey to Un'goro, Knights of the Frozen Throne and Kobolds and Catacombs. With the standard rotation removing all those cards, we will be left with only the weaker expansions, it would be a completly new meta where cards like this might actually be played. After that, a deck with Captain Hooktusk might actually be a thing. 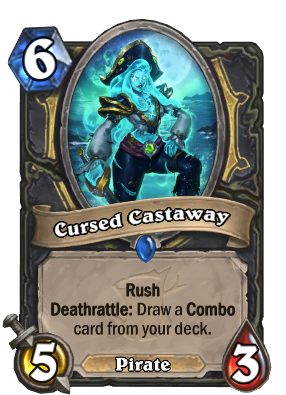 Cursed Castaway is a decently sized pirate; alongside with Ticket Scalper and Southsea Captain and whatever other larger pirates they might print you could make a huge tempo swing. Aside from being an interesting enough card, it also has great N'zoth synergy since it allows you to use removal through trading on an N'zoth turn instead of playing him and instantly jamming the end turn button. Not a tier 1 Decks card. I'd like to try this card with the kobold illusionist/cheat death engine as a combo searcher before tossing it out as a "rogues starfire". ...Maybe? I mean the stat line is okay for Rogue cards and if you play it, later on, you could pull the combo card and play the combo but really this feels like it's more for getting low-cost cards out of your deck so you can draw the big minions. This card is ALOT better than it seems, especially since most combo cards are on the cheap side. Still interesting for late control. I like the synergy with Combo cards but still not sure if this will be viable. Also some synergy with Lesser Onyx Spellstone which hasn't been used too often yet. You guys are all way too worried about what her deathrattle does, instead of realizing that this is another 5 attack minion that can be brought back later in the game for extra value. Gul'dan DK gets it's power from Voidlord (large taunt) and Doomguard (Can attack right away). N'Zoth, the Corruptor (yes, it's rotating. People DO play Wild) can now bring back a large taunt (Deathlord) and now a minion that can attack (Cursed Castaway) for Rogue. It's Deathrattle might as well be "Gain 1 health" and it'd still be a great card. The question is more of can you make a Control Rogue deck with this. This could be really good in Mill Rogue. You play this turn 6 and get a Elven Minstrel. Or play it on turn 10 and just play the Elven Minstrel right there! I'm already theorycrafting a N'Zoth Mill deck that has cards like Rotten Applebaum and Lesser Onyx Spellstone, and this would make a great addition to it. I'm pretty sure I like it, but don't love it. I like 5 damage rush cards for board control (even tho it's 6 mana), and I like cards that reload your hand while doing it. But it really depends upon getting a good combo card, and not all of them are worth paying 6 mana just to remove one minion with 5 health. Basically Starfire but with more ability to select what you "draw". The comparison between Starfire and this is one that makes sense to be made, but unlike those defending this card, I can safely say that this is unfortunately worse. The idea of rush minions being spells with a potential body afterwards is realistic, but in this case that doesn't work out. You don't get the full effect of the "spell" immediately unless the minion dies that turn. This negates most of the value of it being a rush minion instead of a spell. Taunt exists. This is a much larger counter than people seem to be acknowledging. Removal spells are often for minions that your minions can't hit. The combo specific draw is definitely better, but with those two issues, I don't think this will see play. Great potential! I'd love to see that one in action! Not a shocker here, but much better in Wild. Turns out drawing Oil is pretty useful. The curse being that there's only like, 5 combo cards that anyone really uses.